← BookishHeather.com Open for Business! Apparently I’m an idealist. Or a perfectionist. Or maybe they’re the same thing, applied differently. The book didn’t exactly make me vegetarian. 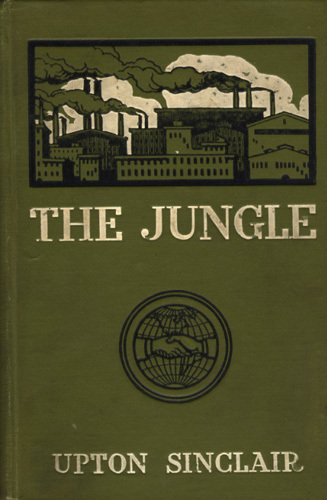 But it did keep me there, with its descriptions of the havoc the meat packing industry was creating for the poor Rudkus family, recent immigrants from Lithuania just trying to survive in a new country. Whether it was an anonymous worker falling in a vat and made into lard, or poor Marija, cutting her hand and almost losing it from infection, the novel was fantastic and tawdry. It was only coincidence that I decided to read this book shortly after deciding to try vegetarianism, but it cemented in my mind that I had absolutely done the right thing. Another book that was instrumental as an agent of social change was Harriet Beecher Stowe’s 1852 novel Uncle Tom’s Cabin, which I just finished writing a big paper about. At the time Stowe was writing the story, she lived in Cincinnati—right across the Ohio River from Kentucky, a major slave state. Escaped slaves using the Underground Railroad were the source of much drama in Cincinnati. When the Fugitive Slave Act was passed in 1850, making it a crime for anyone to assist an escaped slave, Stowe officially solidified her alliance with the abolitionist movement. She decided to combine the political arguments of the abolitionists with dramatic and sentimental fiction. Stowe depicted her African American characters as having distinct voices and feelings, rousing empathy in the reader that they may not have had before, and influencing their stance on slavery. Uncle Tom’s Cabin had an immense impact in the US and around the world. Legend suggests that the book was the single cause of the US Civil War—although that makes a good story, it’s perhaps a bit simplistic. The point is though, that stories about sympathetic fictional characters set against a socio-political backdrop is a really effective method of changing people’s minds about the world around them. Do you have any favorite novels of social change? What books could you envision having this sort of success in changing the world today? Oooh, excellent! I’ve been wanting to read that for years, but still haven’t gotten around to it. Thanks for the reminder!